SAMS-Global is a software system for the simulation of the dispersion of air pollutants during and after an accidental release at stationary (fixed installations) or mobile (for example transportation) sources. SAMS-Global calculates the airborne pollutant concentration in an area up to approx. 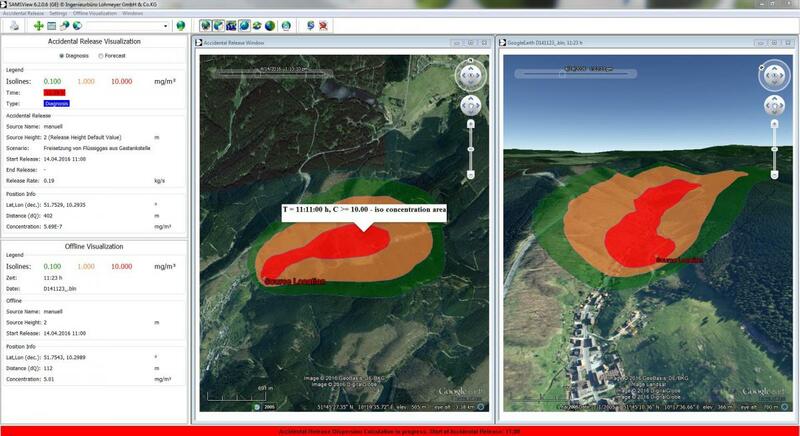 30 km x 30 km and shows as result isolines of the concentration using a Google™ Earth plug in. Therefore for SAMS-Global an internet access is mandatory. The coupling of SAMS-Global to Google Earth allows a world wide use of SAMS-Global. Gaussian cloud model based on guideline VDI 3945 sheet 1 (see: www.vdi.de). Topography and land use data are not included for applications outside of Germany and can be supplemented by us optionally. This is not the subject of the present offer. Without topography and land use data a flat terrain with a homogeneous land cover is assumed for the dispersion calculation. Extrapolation of measured meteorological data (10 minutes average of wind speed, wind velocity, turbulence and atmosperic stability) at one or several meteorological stations. For SAMS-Global no special hardware requirements are necessary. Suitable processors are e.g. Intel® Core i5 or better. Screen size should not be less than 19 inches. Internet access is mandatory. SAMS-Global, single user licence, 6 month email-hotline and software updates included. SAMS-Global supplementary modules are only available in connection with the latest version of SAMS-Global. In case you have a maintenance contract, you always get the latest version of SAMS-Global. In case there is no maintenance contract, for an update to the latest version of SAMS-Global € 39,50 (plus VAT) are charged per month of the period without maintenance contract. The period without maintenance contract starts 6 months after the purchase date of SAMS-Global. For publication of Google Earth images, a separate Google Earth Pro license is required.